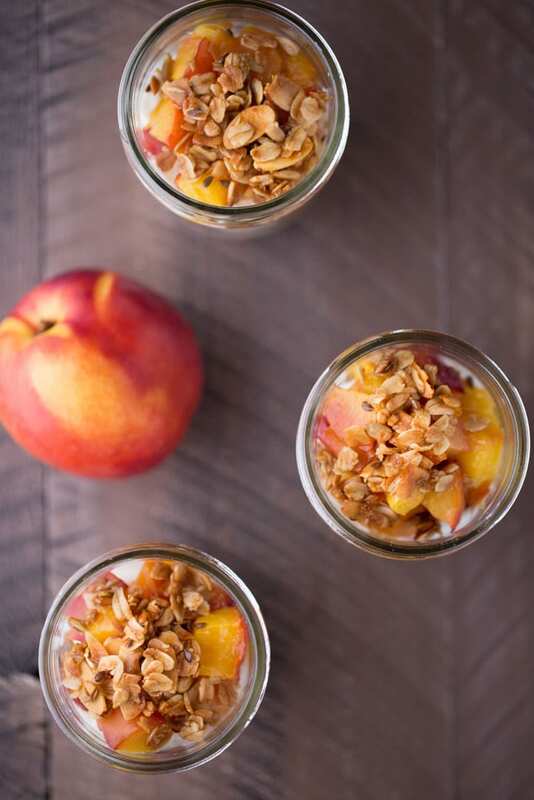 Today we’re celebrating the season of the nectarine by digging into these Roasted Nectarine Greek Yogurt Parfaits. And while we are digging into these delicious Roasted Nectarine Greek Yogurt Parfaits, I want to talk about life, something I don’t do too often within my blog posts. However, after reading posts on negative emotions and social anxiety from Julie from Willow Bird Baking, I’ve been inspired to open up a little more about myself and share some of my trials and tribulations with you. Growing up, my parents always encouraged me to think and live a positive, happy life. Look at the glass as being half full rather than almost empty. Don’t dwell on negative, unsatisfactory situations that have happened in the past; instead, turn the negative into a positive and move towards the future. Easier said than done, right? Wait, am I being negative in that statement? I’ve always felt that I’ve taken a positive approach to life. I suggest positive thinking to others. I take the “glass is half full” approach to many less than desirable situations. I received a C on a test, next time I need to spend more time studying and strive to receive a better grade. This isn’t the end of the world. I’m not going to fail this class. But when I look at the big picture, I realize that I am quite negative when it comes to certain aspects of my life. And that negativity does have an affect on those around me. For example, I’d be lying if I said I was 100% happy with my day job. In fact, I often voice my distaste with my day job to fellow co-workers and to Ken. When voicing my dislike of the job, I often do so with a very poor attitude. I grumble, I grunt, I sit at my desk, angrily completing my tasks, mumbling about how much I hate what I’m doing. Why do I do this, I ask myself? I make decent money at my job. I like my supervisor and my co-workers. I work 4 short miles from my house. I have a 401k plan, with company match. If I want to learn something new, I’m able to. The answer is simple. I look at all of the negative, less than desirable aspects of my job and focus on those, rather than focusing on the positive aspects, which far outweigh the negative aspects. The solution to negativity is quite simple, when it’s put on paper. However, it takes willpower and determination to overcome it. I’ve created a goal for myself. The goal is to eliminate all negative thinking from my life. I will strive to reach this goal by trying to keep a smile on my face at all times. When negative thoughts begin to creep in, I will think of the positive aspects of the situation and feed off of them. If the negative thoughts come from something I cannot control, such as when someone does something that annoys me, I won’t let it bother me. I have no control over it. Getting angry and annoyed over something as simple as multiple exclamation points in an email (I’m serious – I get mad over this) is silly and completely uncalled for. Please, send me all of your excessive exclamation points and I will strive to turn them into happy little exclamation points! You thought I wouldn’t get to these today, didn’t you? I wouldn’t dare forget to share the recipe for these delicious little Greek yogurt parfaits with you. 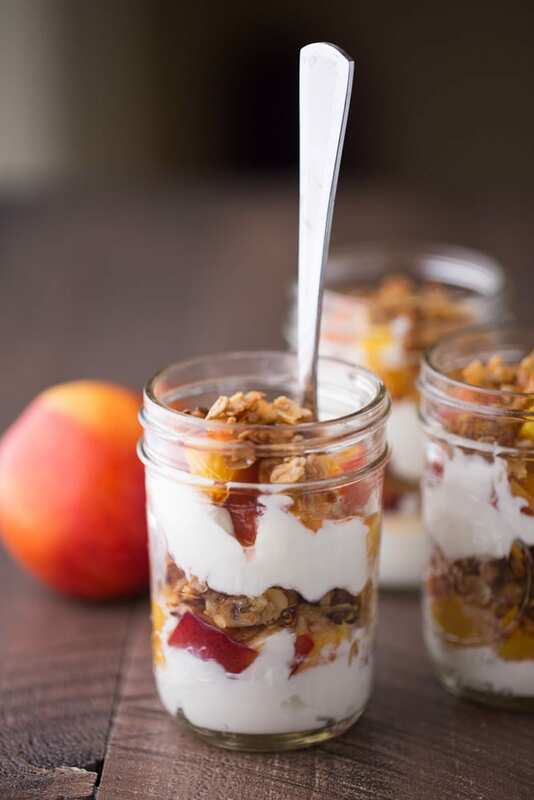 These Roasted Nectarine Greek Yogurt Parfaits are made with fresh, juicy nectarines, my homemade Vanilla Almond Granola and plain Greek yogurt. I roasted the nectarines at 350 for about 20 minutes. 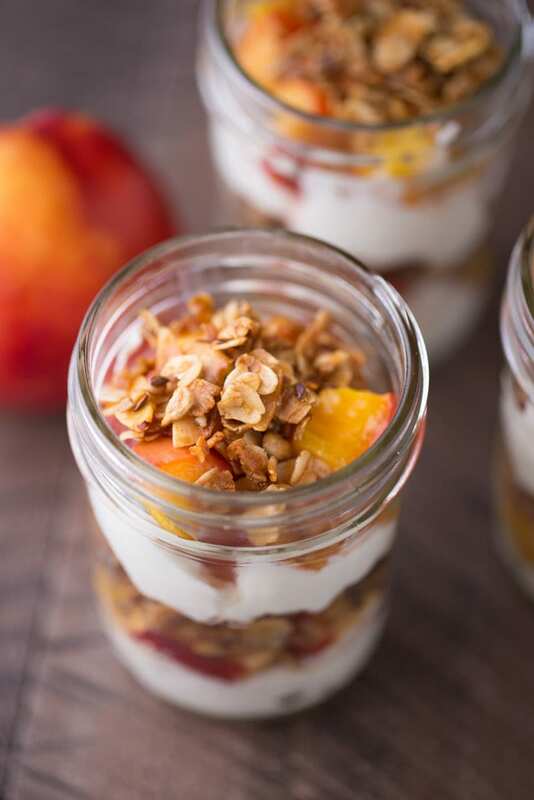 Then I layered the Greek yogurt, nectarines and granola in 6 oz mason jars. You may layer the ingredients in small glasses, if you wish. I chose mason jars because 1) I had them. 2) I can place a lid on them and take the parfaits with me to work, a picnic or to share with a friend. 3 6 ounce mason jars, glasses or small bowls. Preheat your oven to 350. Line a baking sheet with aluminum foil or parchment paper. Place the chopped nectarines on the baking sheet and roast for 20 minutes. Remove from the oven and allow to cool to room temperature or slightly warm. Assemble the parfaits. Place 2 tbsp of Greek yogurt in the bottom of each mason jar (or whichever type of bowl or glass you are using). Then place 1 heaping tbsp of the roasted nectarines into each jar. Follow by placing 2 tbsp of granola in each jar. Repeat this process one more time. The final top layer should be granola. Store covered in a refrigerator for up to 2 days. YES! Trying to live a life of positivity is SUPER hard, but it’s something I have been more aware of lately, and trying to do. It totally helps change your day around! And these parfaits? UMMM, hello breakfast! Love roasting nectarines…pinned! I’m so happy that you are more aware of positivity lately, Taylor! Thinking positive really does make the day more enjoyable! Thank you so much for stopping by and for the pin, Taylor! Have a lovely afternoon. I have never roasted nectarines but it looks and sounds amazing! Nectarines usually never last long enough in my house for me to do anything with them. I love them! I think you would enjoy roasted nectarines, Ashley. Not only are they perfect for these parfaits, I think they would be equally perfect paired with ice cream or sprinkled over a cream tart! I love what your parents taught you about being positive. I always have to remind myself of this along the way when things get rough or crazy in my life. We have so much to be thankful for and so much to be positive about. I also love these parfaits! Roasted nectarines sound perfect combined with greek yogurt. This is my kind of breakfast. Beautiful pictures by the way!! You nailed it, Julia – there are so many things to be thankful for and positive about. We just need to take the time to think about them rather than focusing on the negative. I’m so happy you enjoyed this recipe and this post, Julia! Thank you for stopping by and for the compliment, too! My parents always taught me to look at the glass as half full–it is a daily choice, but one that when you put your mind to it, life is SO SO much more enjoyable! Love the roasted nectarines by the way! Thinking positively is something I am trying to work on too. It sometimes seems like it is much easier to point out the bad then the good. As for the parfaits? Count me in. I love anything with nectarines! You can do it, Kelley! I think you are right – sometimes it is much easier to look at the negative rather than the good. But looking at the good makes life so much happier and easier. I think I’m getting a bunch of nectarines in my CSA box this week so I’ve been trolling around for recipes! This looks great!